I cried this weekend. Scratch that. I cried a lot this weekend. I’m not ashamed to admit that. Why did I cry? I stubbed my toe, obviously… You want the real reason? 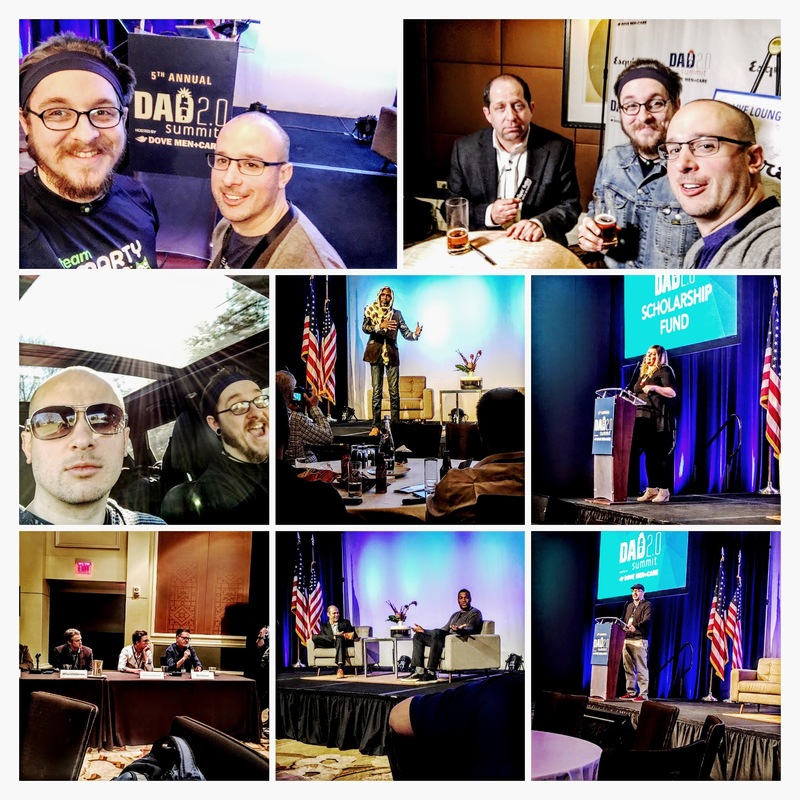 I spent four days in Washington, DC for Dad2.0 Summit. And it.was.amazing. Honestly, it was up there in the pantheon of great experiences of my life. And before you ask, no it doesn’t top the births of my kids or my wedding day. But, it’s up there. I’m still trying to process everything that happened, all that I learned, all that hit home with me, and all the new real-life friends I made. This weekend was a coming together of dads (and some moms) from across the globe, for a meeting of the minds when it comes to modern fatherhood. And it far exceeded any expectations that I had going in. What’s funny is telling people you’re going to a dad blogger conference. They just kind of look at you, like, is that actually a thing? Yes, it is. Dave Lesser can fill you in some more. And it’s amazing. I’m not even sure where to start. From the moment we stepped foot inside the Mandarin Oriental in Washington, DC, I felt home. I felt like I belonged. I felt welcomed. Hanging at the bar with the likes of bloggers that are far more talented than I am–feeling like one of the guys. An opening reception that THE Doug French referred to as a family reunion filled with people you never met. And that is exactly what it was. I hugged, I shook hands, I drank, I talked, I joked, I made more bad jokes, and hugged some more. I looked around the room–at this room filled with so many talented folks–and was in awe. Here I am, a working dad who loves his kids and loves to tell their tales, in a room with guys who do the same thing. And that’s just the opening night. Later that night, going to a bar for karaoke and having the best time. I said this on the podcast we recorded Sunday morning, but the weirdest thing for me was someone coming up to me–some I have never had a conversation with–and them telling me “No, you don’t need to introduce yourself. I know who you are. I love your stuff.” I’m just over here in my little corner of the internet thinking no one knows me. But, they do. And that feels really cool. That first morning, I didn’t know what to expect when keynote speaker Brad Meltzer took the stage. Yeah, that Brad Meltzer. That man knows a thing or two about telling a story. It doesn’t have to be the written word. That guy can tell a story. He spoke on legacy. And that’s the first time I cried. I can’t point to a specific thing that he said that hit me, but his words struck me like a ton of bricks. I’ve talked about my issues with anger in the past, and feeling like I’m failing. And I realized something as he spoke. What have I actually done to fix myself–or the problems in my life? Not enough. The tears flowed. I texted Sarah and told her how much I loved her–which I don’t do enough–and vowed to change that. I vowed to let her see how much I appreciate her, that she and Sophia and Maddie are the number one priority in my life. They don’t see or hear me say it enough. That stops NOW. Brad Meltzer–I know you probably won’t read this–but thank you, sir. Your words stuck with me more than any this weekend. There were also some absolutely fantastic panels, roundtable discussions, and Tednite talks. Oh, yeah, and Michael Strahan showed up for a Q and A session. It took every ounce of my being not to boo that guy, but he was damn funny, and really had some positive things to say. I haven’t even touched on one of the moments that pulled at every single person’s heartstrings, yet. Oren. You remember Oren, don’t you? He’s the man that started the Dad Blogger Facebook Group, who sadly, was taken from us almost exactly a year ago after a nine-month battle with Stage 4 Lung Cancer. His wife, Beth, got up to speak. She read a letter that she had found on Oren’s computer after he passed. Evidently, he had been writing letters to his future self to open on birthdays 10 years later. You could hear Oren in that letter. It stung. It hurt. We miss him. A guy I never met in person–who means so much to so many–in many ways lives through us. If you want to see an example of just how much he means to us, read this post from Creed Anthony, a letter to Oren about Dad2.0. And that doesn’t even talk about the inspiring DadSlam. Where so many guys read posts that had us in tears, laughing our asses off, and just in plain awe. Hearing someone read their words can bring it to life. And that was certainly the case Friday night. I come out of this weekend with a renewed sense of purpose. Not just as a blogger, podcaster, and content creator. But, as a man. As a father. As a husband. As a friend. These guys, these “internet friends” are my actual friends now. Guys who are going through the same ups and downs in life as I am. Guys who will be there at a moment’s notice. This was a weekend that I didn’t know I needed until I was there. I always wanted to go, but never knew how much of a possible life-changing conference it could be. Will I hold on to what I’ve learned and build a legacy that Sarah and my kids and those who know me can be proud of? I sure hope so.